Check-in: after 1.00 pm. Check out before 11.00 am. There is a guests' luggage store room, where it is possible to leave luggage before check-in and after check-out. The price is per room per night. Breakfast is included and it is a Continental buffet. Yes, with cash, credit card or Traveller's Cheques. English, French, Spanish, German, Portuguese and Japanese. How many floors are there and do you have a lift (elevator) in the building? There are six floors and one large elevator. Do the rooms have a terrace or balcony? Yes, there is satellite TV in all the rooms and in the lobby room too. All the rooms are equipped with air conditioning and there is no extra charge for it. No, but the rooms have Internet access by cable and Wifi (payable). The concierge will be very happy to help you to rent a car, a scooter or a bicycle. Fiumicino - Leonardo Da Vinci International (FCO): 35 km. Ciampino Airport (CIA): 24 km. Is there a pickup or shuttle service to and from the airport? Yes, pick up from the airport is provided at a fixed price, and there is a shuttle service to and from the hotel to the airports. 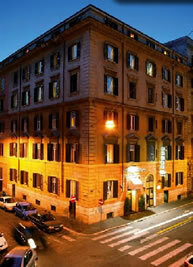 5 minute walk to Termini Station. No, but there is one close by. Yes, small pets are accepted. No, but there are many close by. Is there an internet socket in each room? Yes, all the rooms have a connection.